JOHANNESBURG – CHURCHES, youth organisations and advisory organs of the African Union (AU) have called on Western governments to lift sanctions imposed on Zimbabwe. 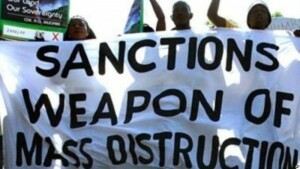 measures include the Africa Union Youth Organisation, AU’s Economic, Social and Cultural Council (ECOSOCC) and Zimbabwe Amalgamated Churches Council (ZACC), which said the sanctions were hurting the majority poor people. Mnangagwa should be given a chance to take Zimbabwe forward and must not be punished for the violations under Mugabe. hurting the wrong target,” Sonti said at the conference in Johannesburg.